Minor Characters at the Invisible Dog. Photo: Elke Young. A perfectly tuned accordion of a play, Minor Character: Six Translations of Uncle Vanya at the Same Time opens with one voice (Astrov rattling on about his restless schedule and his gradual descent into old age) and closes with a chorus (Sonya, younger but no less weary, multiplied across a mosaic of computer monitors as she promises her uncle that he will someday find peace). In the interim, it folds and unfolds with the shimmery grace of a nautilus, carried on billowing waves of text and spectacle. Created by New Saloon, the creative dynamo comprising Milo Cramer, Morgan Green and Madeline Wise, Minor Character is the experimental theatre all experimental theatre wants to be: wackily conceived, rigorously executed, and an exhilarating punch in the gut. The playwright Will Eno, a writer concerned with language’s incapacity to convey feeling, once asked, “What if all the best and most right words for me to truly express myself are Dutch words, or Farsi? And here I am, stuck in English.” It’s an existential question that probably troubled Chekhov as well. In their programme notes, New Saloon quote the author’s own exegesis of Uncle Vanya: “People are sitting at a table having dinner, that’s all, but at the same time their happiness is being created, or their lives are being torn apart.” This problem is at the heart of translation, in which a single word can mean the difference between joy and despair. Toss in a couple of actors, a director, and an audience of a hundred different preconceptions, and it’s a miracle we get any meaning out of anything. Minor Character deals with the problem by embracing it. The cast of sixteen includes three each of Vanya, Sonya, Yelena, and Astrov, who perform the bulk of the experimentation. The first act features three translations and one character per actor; the second, three translations split across three actors per (principal) character. The third act explodes into five translations—Green’s staging here is one of the production’s chief pleasures, so I mustn’t say more—and the fourth contracts into a single adaptation by the accomplished playwright Cramer. The effect is often overwhelming but rarely grating. There’s delight in Minor Character’s dramatic revelations, the glimpses into different facets of humanity, but also in the pure physical experience of the thing, its waterfalls of language, kaleidoscopic ballet of characters, scenes that at once bristle with rage and shiver in quiet terror. If there is anything frustrating about the experiment, it’s that these actors are so talented they occasionally struggle to share the spotlight—certain sequences of simultaneous dialogue lack the conviction of solo performances. These moments are quickly forgotten, however, as Minor Character plows through its four acts with astonishing momentum even in the gentlest moments. Yelena’s second-act flirtation with Astrov, refracted across three translations, is particularly affecting. So is a similarly staged sequence in which she confesses her unhappiness to Sonya, who bursts out laughing and begs her to play the piano. It’s moments like these, when emotions seamlessly give way to their opposites, that keep Chekhov so inscrutably resonant in translation after translation: sorrow yields to joy which yields back to sorrow when Sonya’s father—also Yelena’s husband—says it’s too late for music. 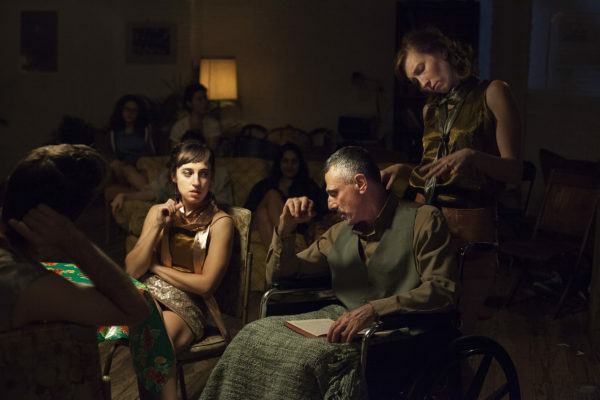 That father-husband is played by David Greenspan, a captivating and elastic performer confined to a wheelchair for most of the play. Green wisely keeps her sidelined players busy. A few musical interludes magnify the haunting, spiritual atmosphere that pervades the Invisible Dog—a massive converted factory space—which already feels rather like the preserved estate of some long-dead nobleman, strewn with musty books and old furniture. Then there’s the magnificent dance number in Act Two, an expressionistic rendering of Vanya and Astrov getting totally drunk. Deepali Gupta’s (Dr. Faustus Lights the Lights) music conspires with M. Florian Staab’s sound design (are those real crickets and birds chirping just outside the French windows?) to make Minor Character a dense sonic experience. Masha Tsimming illuminates Kristen Robinson’s in-the-round set with appropriate softness, tinged with, and occasionally eclipsed by, shadow. Costume designer Emily Oliveira deserves mention for dressing these characters in an idiosyncratic wardrobe (silky golds for the Yelenas, thick sweaters for the Sonyas, bright crimson jackets for the Astrovs) that, rather than evoking a single time or place, suggests we are rather frozen in several. But really everyone here deserves mention. This is truly a singular production, fully imagined and confidently wrought. Minor Character was on at the Invisible Dog. Click here for more information.